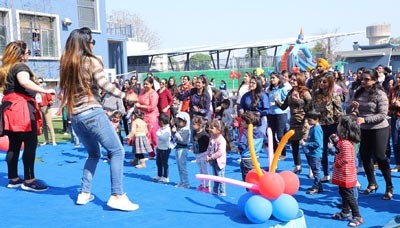 Ludhiana, March 18, 2019 (News Team): Sat Paul Mittal School organized the ‘Satyan Open House’- an event to celebrate the young kindergartners’ transition from a playway to the formal schooling on 18th March, 2019. The event helped to make the school an exciting and welcoming place for new students and their families. The teachers greeted the incoming kindergartners with cheers, high-fives and smiling faces along with live cartoon characters of Peppa Pig and Mickey Mouse. The best thing about memories is to create them; so, a photo booth for ‘First Day to School’ was created for little Satyans with their parents. To help the kids explore the love for outdoors and adventure, a plethora of adventure and fun filled activities were organized. The parents were thrilled with joy to see the smile on their child’s face. The kids and parents also enjoyed a refreshing zumba session by Satyan dance teachers. Thereafter, the class mentors took the tiny Satyans for a mini tour to the respective classes along with the parents. To mark the beginning of the most important phase in the student’s life, the children were given a handmade token by their class teacher. The children and the parents had a wonderful and adventure filled day and went back with happy memories of the first day of the school.